This article was published in the print magazine Drupal Watchdog , Volume 1 Issue 1, 2011-03-07 , on pages 35-36, by Tag1 Publishing. The magazine was distributed at DrupalCon Chicago, 2011-03-07 . The article was also published on their website. There are numerous ways for programmers of all skill levels to get up to speed on this most recent version of our favorite content management system. Reading a Drupal 7 book (or several) offers some advantages, especially if you take the time and effort to work through the examples provided by the author(s): Unlike an article or even a lengthy tutorial, a book can convey far more detailed information; it allows you to jump from one section to another faster than any other medium; it can be personalized with notes in the margins or highlighting; and it will continue functioning even if the electricity goes out! Of all the technical publishers, Apress is to be commended for producing five of the titles on our list — three of which should be suitable for nonprogrammers. 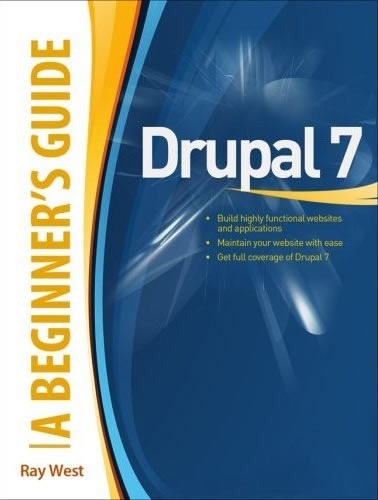 For instance, Beginning Drupal 7 and The Definitive Guide to Drupal 7 differ markedly in how they go about instructing the reader. 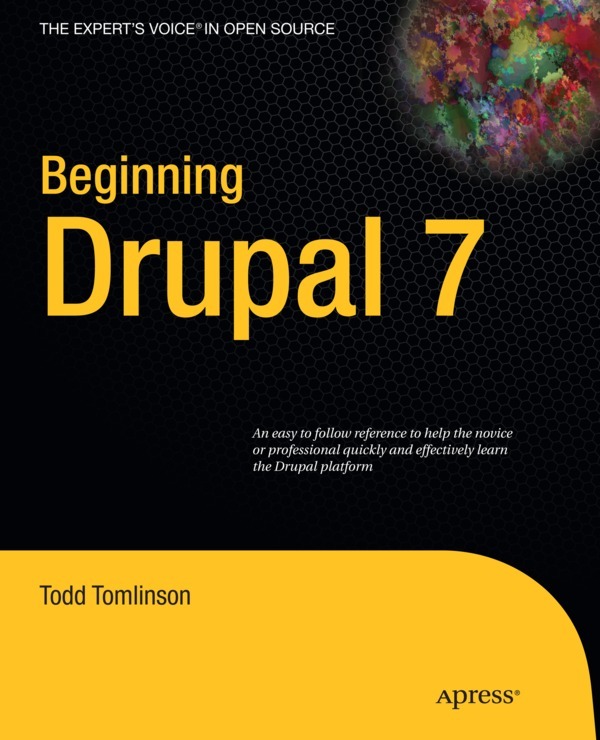 Beginning Drupal 7 was written by a single author, Todd Tomlinson, and employs a great many screenshots to illustrate everything from Drupal installation to the use of views, panels, and themes. 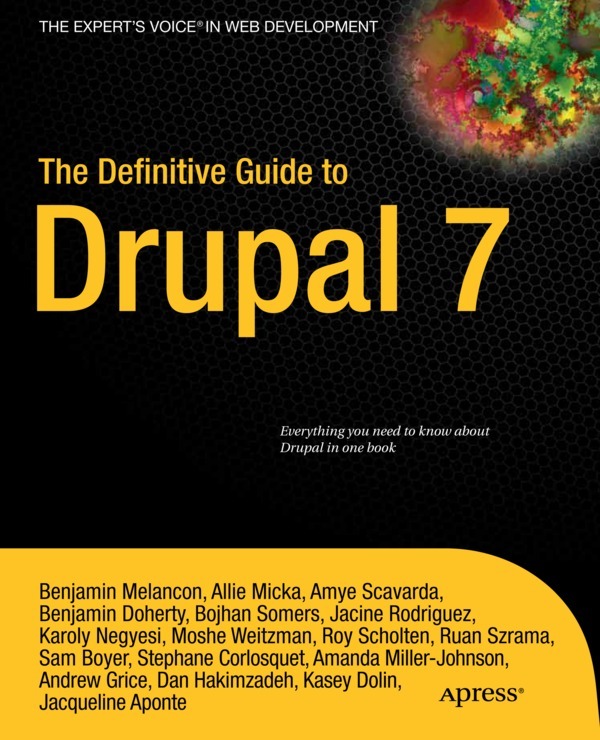 In contrast, The Definitive Guide to Drupal 7 boasts 15 authors, and is almost twice as long, with much narrative and some sample code. Intended to be quite comprehensive, it covers not only the basics, but also shows how to plan successful projects, develop modules, and contribute to the Drupal community. As of this writing, it is scheduled to be published on 28 February 2011. 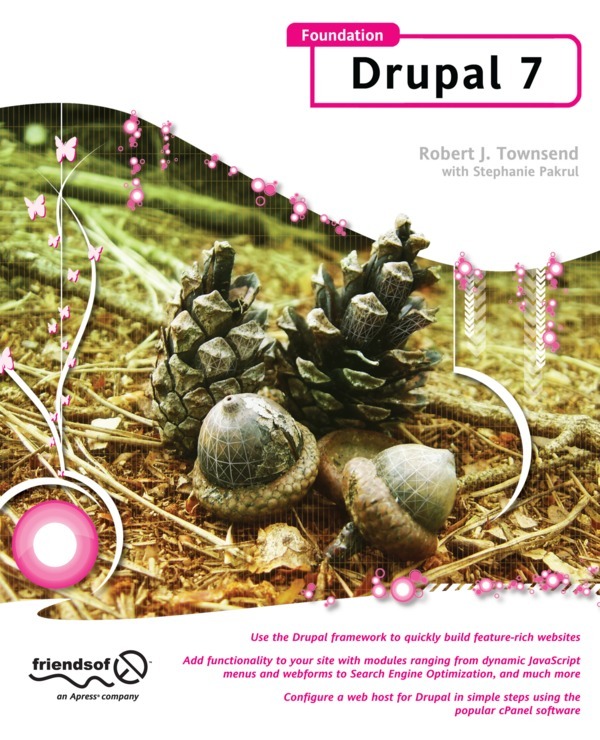 Robert J. Townsend takes a more technical approach in his Foundation Drupal 7, by including some topics not seen in similar books, such as how to set up multiple site installations. Another publisher building its catalog of open-source software books is Packt Publishing, which has made available two introductory titles: Drupal 7, by David Mercer, is a follow-up to his earlier book Building Powerful and Robust Websites with Drupal 6, and is completely updated, based upon the major improvements to Drupal, as well as reader feedback. 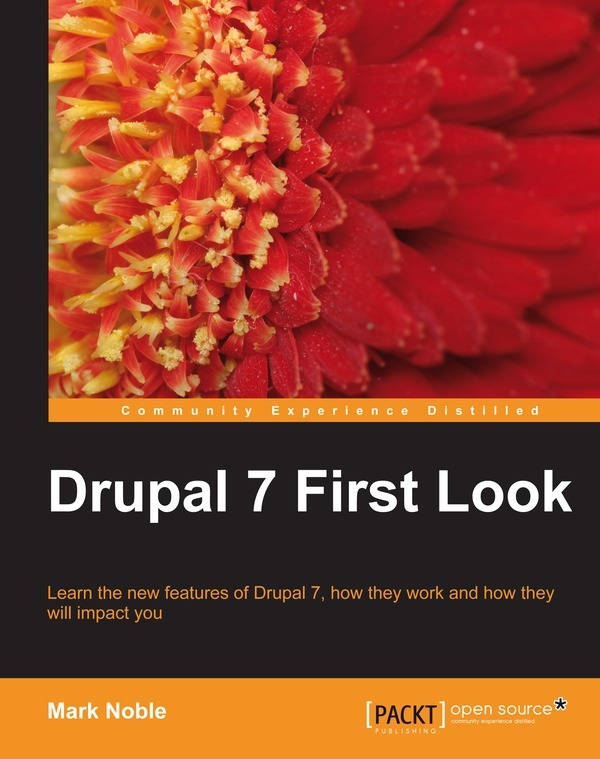 Mark Noble's Drupal 7 First Look covers some of the same concepts, with an emphasis upon the new features in Drupal 7, including the significant changes to the module and theme APIs, as well as improvements to security, image handling, and the administrative interface. These two books were published in September and August of 2010, respectively — months before the final version of Drupal 7 was available — and thus are based instead upon the earliest alpha releases. 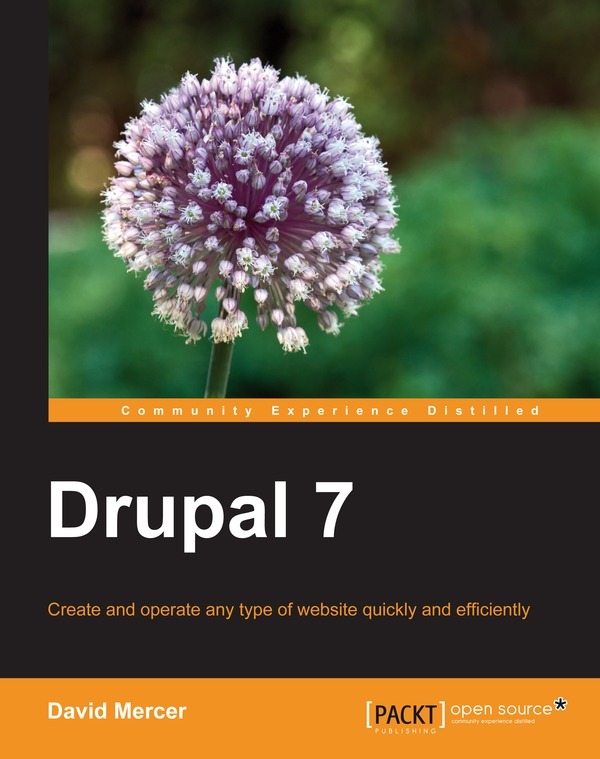 Consequently, readers may find discrepancies between the material presented and what they would see using the currently available version of Drupal 7. The larger technical publishing groups tend to be more cautious in producing (and investing in) books devoted to hot new technologies or recent updates thereof. This is illustrated by two of the veteran publishers: McGraw-Hill Osborne Media has neglected content management systems in the past, but the tide may be turning with Ray West's Drupal 7: A Beginner's Guide, slated for publication on 22 September 2011 (although that may change, given that even the cover art has not yet been finalized). Wrox — known for its hefty 3GL programming books — jumped on the Drupal 7 bandwagon with Jacob Redding's Beginning Drupal. Their titles are renowned for packing in a lot of material, and this one is no exception at 480 pages. 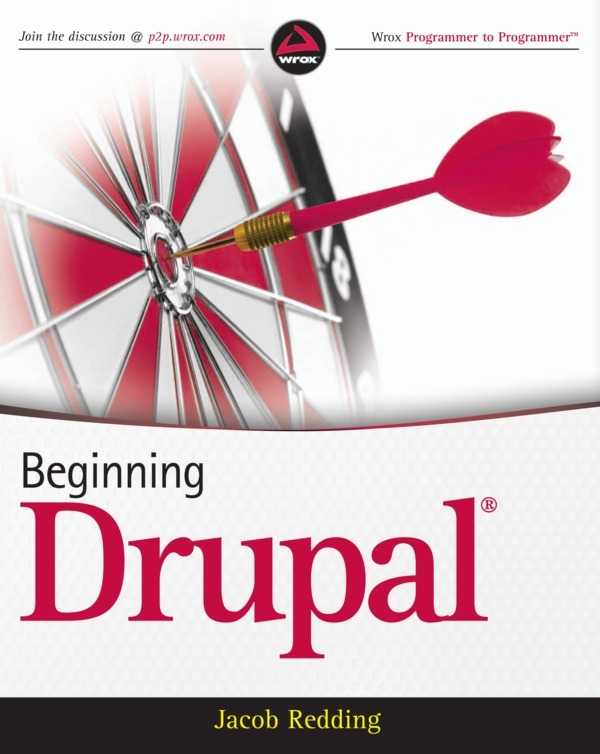 Beginning Drupal covers the topics one would expect to find — including how to install Drupal, configure modules, manage content and users, and create views — but also explores more advanced subjects, such as taxonomy, workflows, internationalization, and the basics of custom module development. 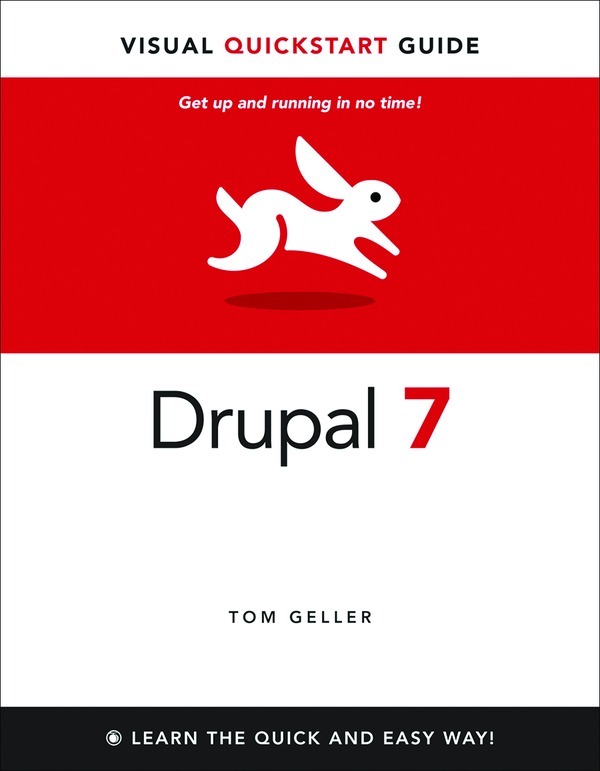 Also joining the Drupal 7 parade are two newer publishers, including Peachpit Press, which released Drupal 7: Visual QuickStart Guide, authored by Tom Geller. At a relatively svelte 264 pages, it poses less danger if accidentally dropped on one's foot, and is a promising guide written specifically for anyone working with Drupal for the first time — using a step-by-step tutorial approach and lots of screenshots, as suggested by its title. Some of the more advanced topics that it does not cover — localization/internationalization, marketing, and e-commerce — will be the emphasis of Going Global with Drupal 7: Creating Sustainable, Multilingual Web Sites, written by Todd Kelsey, and scheduled to be published by Course Technology PTR on 18 May 2011. 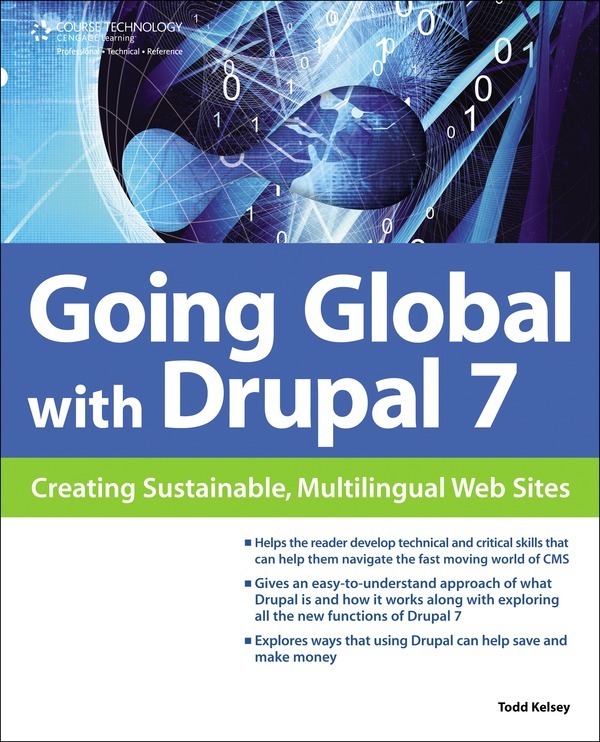 The publisher's marketing summary states that not only will this book teach readers how to create and maintain Drupal 7 websites in several languages, but also how to promote and monetize those sites. 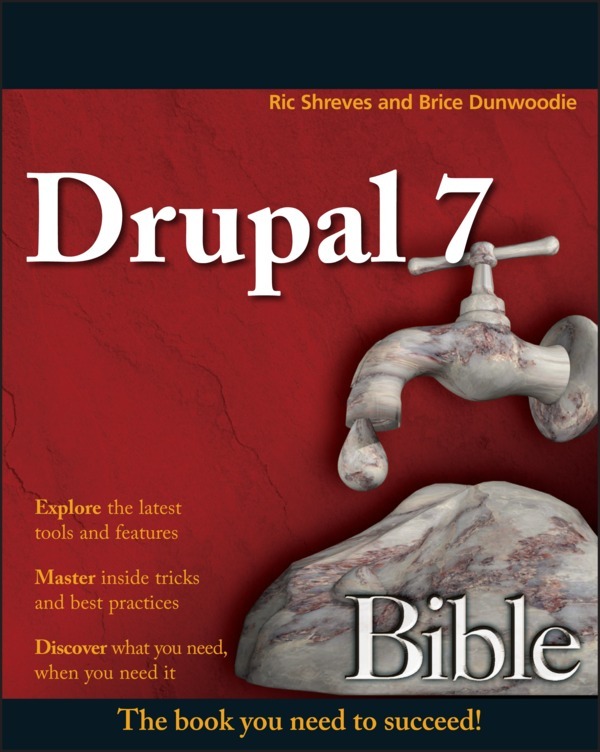 At 744 pages, Drupal 7 Bible may become the "King James version" of Drupal books. Authored by Ric Shreves and Brice Dunwoodie, it is scheduled to be released by Wiley on 10 May 2011. Based upon the publisher's marketing literature, this upcoming title will explain how to set up and maintain a Drupal 7 site, add content to it, install core modules (e.g., Forum, Blog, Aggregator, Poll, and User Profile), find and install contributed modules (for galleries, newsletters, etc. ), and set up an online store using Ubercart. Intermediate and advanced Drupalers have not been neglected by the publishers, as evidenced by three titles — two from Apress: Pro Drupal 7 Development, now in its third edition, is the latest in a series regarded by countless Drupal developers as the gold standard for learning how to create custom modules. 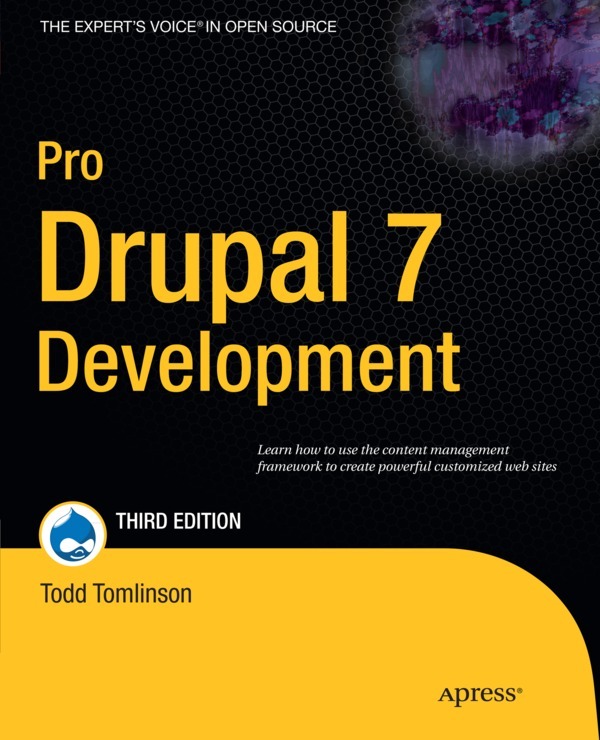 Within its 720 pages, Todd Tomlinson and John K. VanDyke explain Drupal internals, hooks, triggers, actions, the menu system, all the major Drupal APIs (some of which have changed significantly with version 7), the theme system, forms, files, taxonomies, caching, and sessions, as well as best practices in writing Drupal code and contributing it to the world. 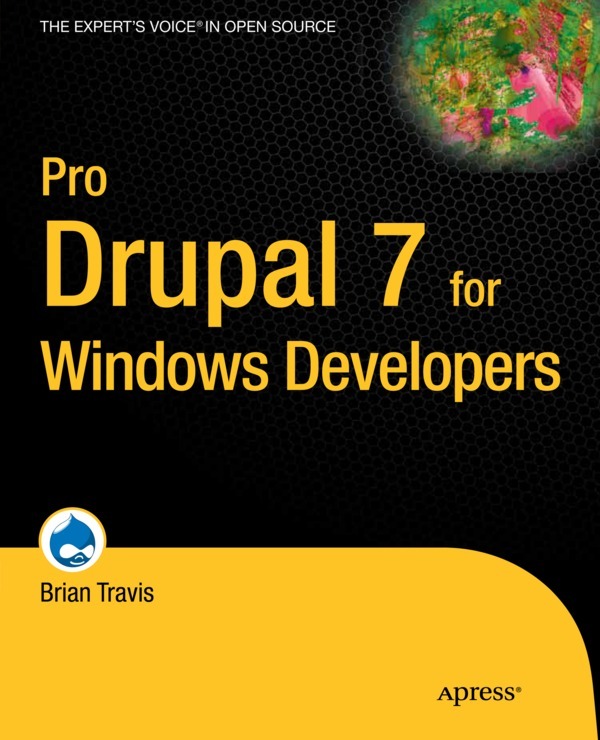 Planned for release on 31 March 2011, Pro Drupal 7 for Windows Developers, by Brian Travis, should serve to counterbalance the Linux bias found in most Drupal books and other resources. Intended for .NET and ASP developers, it demonstrates how to install Drupal 7 on a Windows web server based on Apache or IIS; how to debug Drupal sites utilizing Microsoft Visual Studio; and how to build custom Drupal modules and themes. 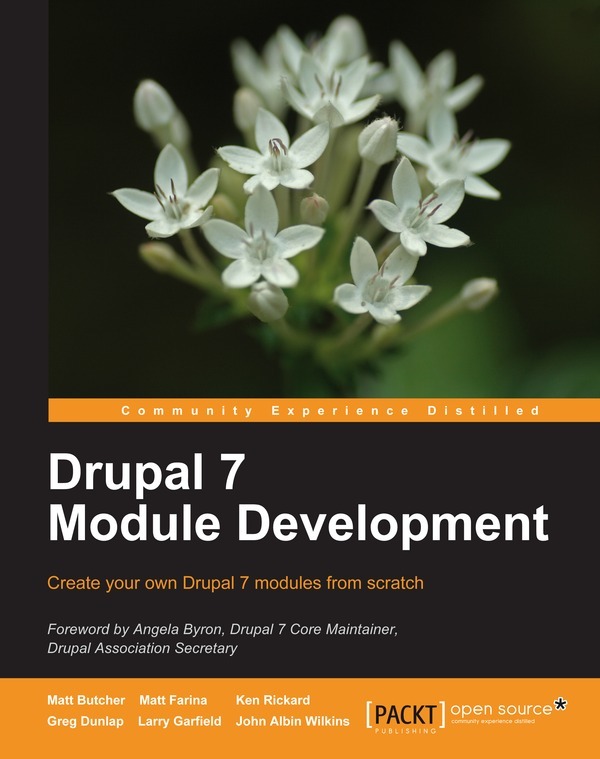 For the hard-core Drupalistas, Packt Publishing offers Drupal 7 Module Development, written by six veteran coders — Matt Butcher, Greg Dunlap, Matt Farina, Larry Garfield, Ken Rickard, and John Albin Wilkins. Like Pro Drupal 7 Development, Drupal 7 Module Development is not for the faint of heart, nor anyone new to PHP programming or Drupal itself. Each author has contributed chapters in his area of expertise, such as: Drupal's theme layer and techniques for theming a custom module; the menu system and the Form API; dynamic creation of node, entities, fields, and other components of content; and permissions, roles, and users. Any one of the above books could be a promising resource as you continue your path to Drupal mastery.